Brian Dowd-Uribe is an Assistant Professor in the Department of Environment, Peace, and Security at the University for Peace. 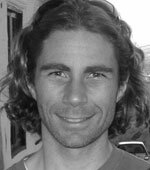 Brian joined the CRED team as a postdoctoral research scientist in September 2011 after gaining his PhD in Environmental Studies from UC Santa Cruz. Brian currently works on two CRED projects. One examines how different values and perceptions of water shape decision processes in local water management committees in Burkina Faso. Brian also is a lead researcher on the Ultra-Ex project, which examines local perceptions of greening efforts in East Harlem. Brian’s previous research focused on the impacts of transgenic crop introductions and commodity chain liberalizations on local communities in Burkina Faso.